UW-Madison has one of, if not the, premier overall NCAA sports programs in the nation (even people outside our state are coming around to it like USA Today, CBS Sports, even rival Minnesota's Star Tribune had to admit it. Their recent, long-standing, records in men's basketball & football speak for themselves but they also have been consistently great in other sports as well across men's (hockey) and women's (hockey & volleyball) teams. Perhaps most impressive is the unprecedented and unequaled 15-year streak of the football team has playing in a bowl game and men's basketball team qualifying for the NCAA tournament (3 more years then the next longest). But definitely most impressive is that the university does it all while maintaining what the Wall Street Journal has named the Most Admirable program regarding academics, violations and probation, arrests, and other ways the program is run well with a focus on student-athletes - student being first. 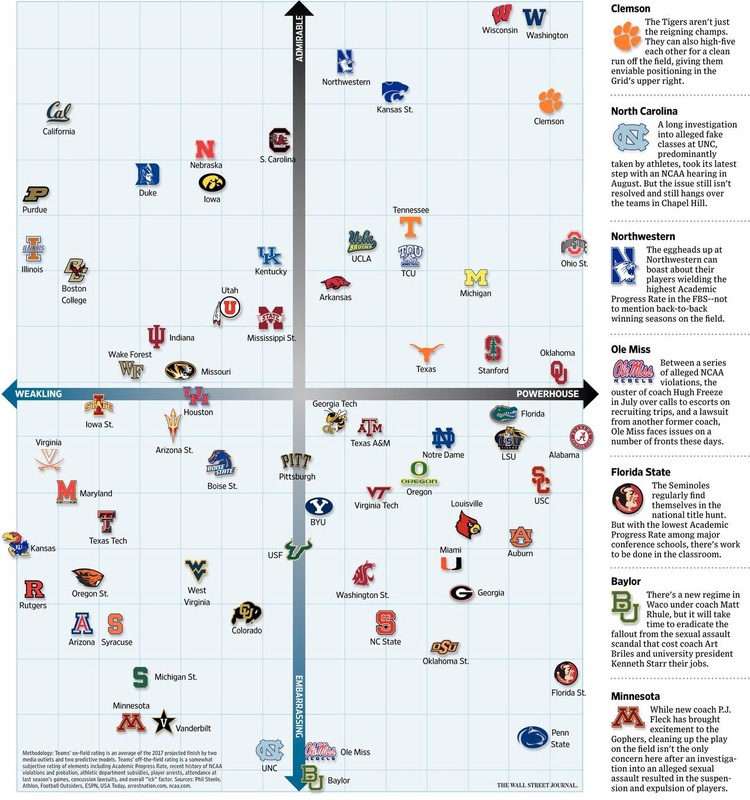 Every year the WSJ puts out an updated Grid of Shame weighing football programs' on- and off-field successes and blemishes. It shows in some manner the difference between schools who have success (are considered a Powerhouse) but with shady, or shameful, win-at-all-costs practices vs. those that try for character first and success second. Of course a program that can score high on both Powerhouse and Admiration are truly 'elite' programs. 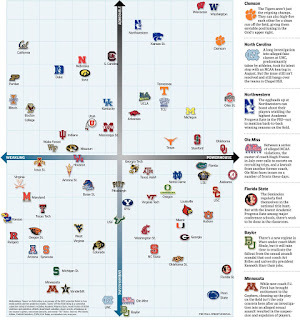 In this year's edition, UW has scored highest on the Admirable scale and is near the top of Powerhouse. Only 5 teams rank higher on the Powerhouse scale, that's pretty good right there, but no one ranks higher on Admirable. The only team close is Washington who is slightly higher on Powerhouse and slightly lower on Admirable. Only 3 other teams are anywhere close on Admirable. Now this is specifically for football but it likely extends naturally to all programs at least on the Admirable scale. But as we saw earlier, many UW programs would rank high on the Powerhouse as well. During a time when pro and college sports seem to be in mercenary mode, picking for talent alone not character, and college teams - specifically men's basketball and football, especially basketball - want flash in the pan players who will help now and not develop them (the NBA one-and-done rule taking players after 1 year except programs where the education is valued from start to finish) it means a lot for a program to do it cleanly. In Wisconsin we call all be proud of our flagship university being so highly considered. Wisconsin is finally getting some national recognition for its overall excellence in athletics, but it is even better to know they are doing it 'admirably'.